Gun safety should be number one on every gun owners list. Before deciding which gun you wish to purchase and why you should be looking at how you’re going to store it. Keeping your firearm locked up prevents possible theft or misuse from younger family members and, in many states, is a requirement regardless of who lives in your home. Pistols and long guns can be an investment, and, like any costly investment, you want to protect it for the long haul. Your safe may even keep your gun protected from unexpected events, such as floods and fires. Not to mention, gun safes typically have enough room to store other valuables, like jewelry, memento’s and other expensive hobby gear. Who wouldn’t want to jump at the chance of shielding their most valuable possessions? Finding the right gun safe may require research, but rather than have you scour the internet for the answers you’re looking for, we’ve laid out everything you need to know and some of the best options for both long guns and pistols. You can also take a look at our top gun safe buying guide after the reviews. Considering you likely only use something like a rifle while you’re out hunting or partaking in target practice or competitions, it’s always best to keep them locked up in between uses. Not only will this keep you and your family safe from any misuse, it will prevent your firearm from being exposed to the elements and potentially damaged. Long gun safes are considerably large, especially compared to pistol safes, so ensure you have space before setting out to purchase one. If you have the cash to spend, the Fatboy series from Liberty is a consistently great option for storing your firearms. Known for their spacious interiors and durable builds, Fatboy is a favorite among gun lovers. The Fatboy is designed to hold up to 64 guns, which fit nicely in two collector racks capable of holding 32 guns each There is also a Fatboy Jr that holds a little bit less (48 guns) and at a much nicer price. It’s an unparalleled amount of storage that still leaves room for other accessories and even store your most valuable possessions that you don’t want to lay around the house. One of the best things about the Fatboy series is its level of customization. Pick out the color of the interior, which comes as a soft fabric to keep your equipment protected during storage, decide whether you want a mechanical (keyed) or digital combination lock, and then choose from an array of accessories that include a smart vault for even more protection for your valued items, a monitoring system that alerts you to any changes in the state of your safe, extra pistol storage. The Fatboy may cost a lot – and we do mean a lot, but it is an incomparable model that offers so much without sacrificing its main purpose of keeping your long guns safe. Premium Protection: The Fatboy comes equipped with 14 1.25”-diameter bolts and is built for protection from fire damage for up to 75 minutes in temperatures as high as 1,200°F. Customizable: Most safes come “as-is,” but Liberty lets you customize yours with a slew of different accessories and storage. You can also decide whether you want a mechanical or digital lock. Ample Storage: Even without the customizable storage, the base models is large enough to fit up to 64 guns along with a host of accessories and equipment. The Jr holds up to 48 guns in the safe. Cost: There is no doubt that the Fatboy series is one of the most expensive models on the market, making it inaccessible to casual rifle owners. Store up to 12 rifles in this large-capacity standing safe and keep it all protected with a system capable of remembering 120 fingerprints. Locked via biometric technology and a five-deadbolt locking system, breaking into the Barska Large Biometric Rifle Safe is no easy feat – if at all possible. A cushioned interior shows that Barska knows most gun owners prefer to keep their firearms in pristine shape. Worried about it toppling over? This 57”-tall safe is capable of being mounted to a foundation, such as cement, for improved safety. Though it may not have storage for much more than 12 rifles, some ammunition, and a handgun, the interior is spacious enough to not get crowded with all of those items. The biometric technology allows users to access their equipment within seconds. Biometric Locking: With just a fingerprint, users can open this safe within seconds, removing the need to remember a combination or where keys were hidden. Backup Keys: If the scanner’s batteries (2 AAs) die, the unit comes with backup keys for entry. Customizable Storage: Though the space isn’t large, shelving units can be removed for maximum storage. No Fire Protection: The Barska is not designed to protect from fires, leaving the enclosed equipment susceptible to damage. No Extra Storage: Besides three removable shelves, there aren’t any storage pouches or compartments for other valuables. Pop open this bulky long gun safe to find a treasure trove of compartments and storage for more than just your long guns. For the organized firearm owner, the Amsec can provide a multitude of different options on how to arrange each rifle, each pistol, ammunition, and even valuable items that you don’t want loose and unsecured. The heavy steel and ½” steel plated door is backed up by 1” DryLight insulation to amplify fire protection. For up to 90 minutes, the Amsec BF7240 can withstand temperatures of up to 1,275°F thanks to the dual fire silicone seals on the door jamb. When the lock is engaged, 10 thick bolts clamp shut, preventing any unwanted entry. The heavy steel build is drill and pry proof while the interior is coated with a soft fabric to prevent your items from scuffing or scratching as you use and replace them. Spacious Interior: Store multiple long guns, pistols, ammunition, supplies, and valuables on the adjustable shelving and built-in door storage. Fire Proof: The Amsec can withstand heats of up to 1,275°F for an hour and a half. Even as the fire burns outside, the silicon seal helps prevent an increase in temperature inside the safe. Cost: The Amsec BF7240 comes at a very hefty price due to its security rating and features, topping off at near five times other similar safes. Coated with 18-gauge powder, the Paragon Lock & Safe is better protected than other models in the market. Hidden hinges amplify theft protection while a heavy steel construction is used to deter attempted drilling, Within the unit, eight long guns will fit without issue and are protected by a matted bottom, which gives extra cushioning. The interior construction is simple, focusing more on rifle storage than other valuables. There is a small lockbox built into the top of this 55”-tall safe which can hold a pistol, ammunition, or treasured personal belongings. The Paragon is a simple safe, designed specifically for the gun owner that likes to bypass the bells and whistles of more complicated models. Two sets of keys lock and unlock the interior and exterior locks, with the main door kept in place by two solid locking bolts. Included Interior Lockbox: Though there isn’t much in the way of extra storage, there is a secondary, smaller lockbox built into the safe perfect for pistols, ammunition, or jewelry. 18-Gauge Powder: Coated in 18-gauge powder provides a more durable and sturdy design to protect your firearms and personal belongings. Hidden Hinges: Craft thieves won’t be able to break through the hinges as they are hidden and inaccessible. Two Locking Bolts: As many safes are equipped with multiple locking bolts, having only two comes as a negative aspect of this safe’s build. Simple Interior: No extra shelving is included with this safe, making it suitable for just the eight long guns and the small items that fit in the top safe. Multiple Keys: Two sets of keys unlock the outer door and smaller safe found inside. Take comfort in knowing that your firearms are protected by 1.5” thick 12-gauge steel that is resistant to drilling, prying, or hacking. Eight, 1” door bolts provide even more security and are locked into place by a combination lock. Different levels of shelving allow owners to protect more than just long guns, such as jewelry and important documents. Paper documents and firearms are provided an extra level of protection thanks to the 1,200°F fire lining which keeps items within the safe undamaged for up to 30 minutes. At 59” tall and 28” wide, the BigHorn is a sizable and could fit upwards of 20 rifles, depending on the long gun size. Pistols store neatly on any of the four shelves and compartments. 75” Overall Thickness: Firearms and all other personal items are kept amply safe thanks to the 12-gauge steel, which protects from drilling and prying. Eight Door Bolts: Controlled by a combination lock, eight, 1” door bolts make it even more difficult for thieves to break into the safe. Combination Lock: With no backup key method, this unit is unlocked via combination only, which can be problematic if the combination is lost. Though the average capacity of the Steelwater ranges from eight to 10 long guns, its additional storage options more-than make up for the smaller rifle space. Compartments built into the 4”-thick door, which is drill and ballistic proof. Ten 1.5” steel locking bolts are used for maximum security, ensuring everything within the safe – which can include assault rifles, hunting rifles, classic rifles, pistols, ammo, and jewelry – is 100% protected at all times. Beyond theft protection, the Steelwater also provides shielding from fires up to temperatures of 1,875°F. Items inside the safe will withstand these temperatures for up to one hour. As a bonus, the electronic combination lock is EMP proof, meaning it will withstand in even the most unexpected conditions and emergency scenarios. Though it’s locked via combination, if you have trouble remembering, the safe also comes with a set of bypass keys to ensure your guns are never locked away from your reach. On the inside of the case, should the power go out, a built-in LED light will illuminate your equipment. Upholstered Interior: The cloth interior ensures that your firearms are protected from scratching and scuffing while in storage. Ample Storage: Along with seven upholstered compartments, the inside of the door also has eight large pouches to hold ammo or store valuable personal items. EMP Proof Locking System: Protection from electronic pulses makes this one of the most secure safes on the market and a must-have for in case of foreign attacks. Small Interior: The storage space for long guns is somewhat smaller than other models, fitting an average of only eight to 10 rifles. Though pistols are considerably easier to hide than shotguns and assault rifles, it’s still highly recommended (and possibly mandated) you keep yours in a gun safe to prevent accidents or theft. The following safes are among the best on the market, providing maximum security and protection for your handgun. Many gun safes allow for quick access in case of an emergency, so don’t feel like you’re locking up your own protective device. The digital keypad on this easy-access pistol safe provides quick entry when needed. 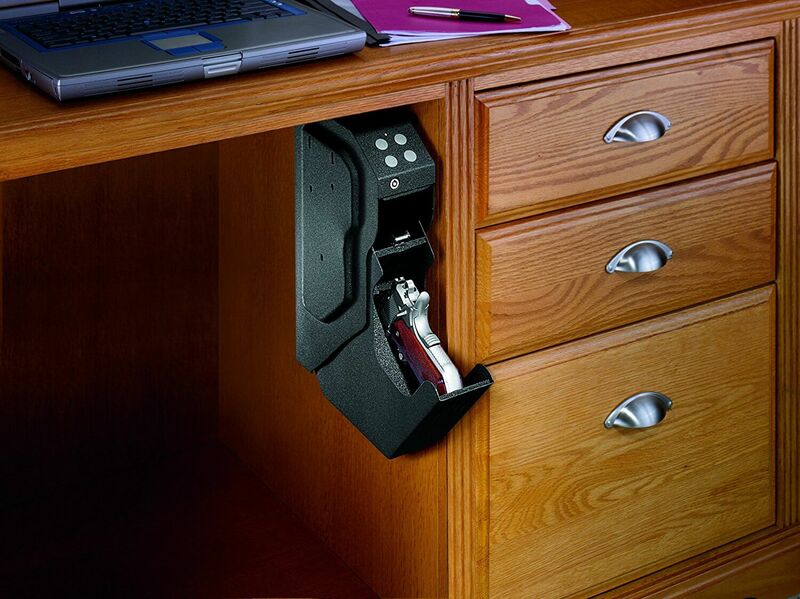 The drop-down drawer puts the pistol in a quick-draw position in emergency situations while also keeping the gun protected when not in use or needed. The compact size makes it suitable for around the house or in a vehicle and is light and easy-to-move should the need arise. The Gunvault is designed to be mounted on many surfaces and is equipped with an interior light to make it possible to see in low-light situations. To prevent intruders from knowing a gun safe is being unlocked, the keypad has a silent mode. The 18-gauge steel built will protect your firearm and your family by keeping unwanted users from breaking in and accessing your handgun. Mounted Design: Being able to mount this safe on a multitude of surfaces makes it accessible in home or vehicle. The mount is sturdy and will hold up over time. Silent Mode: In emergency situations, it’s sometimes best if no one else knows you’re accessing a gun safe. This allows you the chances to surprise any intruders that may be in your home. Backup Key: The electronic lock runs on one 9V battery, but the safe can be accessed via the included backup key. Sensitive Keypad: Though it’s quick to access, the keypad can also be too sensitive for its own good. Make sure you know the nuances of it before needing to access your pistol on a whim. This uniquely designed safe makes it so that your handgun can be safely stored anywhere in your house and not just where the least foot traffic is. The case locks tight and remains as such until the RFID keycards or RFID key fobs are used to unlock it. The safe will only respond to the corresponding RFID signals, making it one of the most secure handgun safes out there. Other means of opening beyond RFID include the fingerprint scanner and by Bluetooth via the Gunbox smartphone app. The hydraulic opening is smooth and quick, providing you quick access when the situation arises while the 4mm Die Cast Aluminum keeps it lightweight but heavily protected. Rather than deal with AA or 9V batteries, the Gunbox 2.0 runs off of a rechargeable lithium battery that, on a full charge, can last up to one year. If the unit is moved, a sensor alarm sounds, ensuring maximum security around the house. Smartphone Enabled: Via the Gunbox smartphone app, the Gunbox’s fingerprint sensor can be set up and the unit can be opened via a Bluetooth signal. Feature-Rich: More than just a gun safe, the Gunbox can also help charge electronics via the USB charging ports. The audible motion alarm is an added benefit for families with children. The rechargeable lithium battery also removes the need to buy batteries every-so-often. Multiple Methods of Entry: Either through the app, by using your fingerprint, or with the included RFID keycards and fobs, access to your handgun is simple and quick. Limited Storage Space: Being compact and light, the Gunbox 2.0 doesn’t have much in the way of extra storage. Fit one or two pistols and some ammo and this case is at capacity. It doesn’t get much more simplistic than the NanoVault 200, but simplicity isn’t necessarily a bad thing. The compact size of this pistol lockbox means you can place it virtually anywhere convenient, ensuring it’s where you need it to be when you need it to be there. While it may not look secure, the included security cable will keep it from walking off. Locked and unlocked by a simple key, this safe is a no-frills option that gets the job down. The interior is lined with ½” thick memory fitting foam, providing your firearm a soft bed to rest on to avoid getting scratched or scuffed. The exterior shell is an 18-gauge steel that will not buckle, even under the most persistent beating. Drill and pry-resistant, your pistol is in good hands in the NanoVault 200. Compact and Lightweight: At only 3 lbs and 1.5” x 6.5” x 9.5”, this gun safe will fit in many convenient locations around the house. It even travels well. Heavy Steel Housing: The 18-gauge steel housing provides solid protection from the elements and outside parties. No Alternate Unlocking Method: If you lose the keys, it’s going to require a trip to the locksmith to get the safe open, and that’s if you can find someone to open a gun safe. Designed to be child-resistant but still accessible by its owner, the Hornady Security Rapid Gun Safe is a technological wonder that provides quick entry and multiple access options. 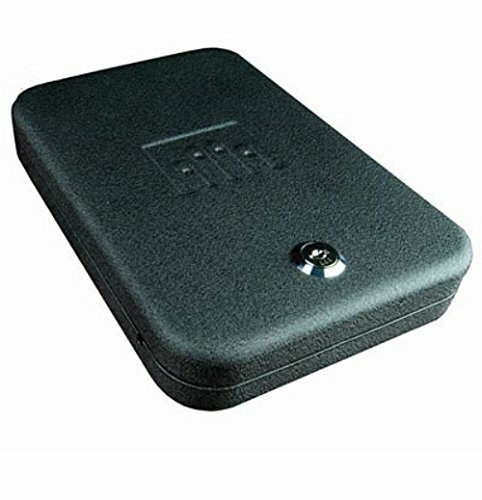 Through either an RFID bracelet, RFID card, or key fob, this case can be opened without evening touching it. Though it’s easy to open and does so without delay, the Hornady is still a protective case for your firearm, which it stores in a holster that makes it easy to grab and fire in emergency scenarios. Though there isn’t much space for anything else besides the handgun, Hornady’s quick-access gun safe is an undeniably safe model with amplified security thanks to the heavy-duty security cable. Designed from 16-gauge steel construction and kept shut by a ¼” steel dual-lug lock, the Rapid Gun Safe will keep the contents perfectly safe from harm as well as unwanted access. Multiple Entry Methods: The Rapid Gun Safe comes with an RFID bracelet, keycard, or key fob, all of which provide touchless entry. Each method delivers differing sensitivity levels, so you may need to try each one to determine which you prefer. Easily Programmed: It doesn’t take much to set the Hornady gun safe up with the RFID Within minutes you should be able to lock your pistol up without issue. Quick-Draw Access: Pistols are stored with the handle facing out. This allows for a quick grab in emergency situations. Limited Storage: Don’t expect to store much else besides your pistol in this quick-access pistol safe. You may need another space to store ammo. A recognizable brand in the gun safe market, SentrySafe is a reliable and compact option for storing your pistol and keeping it from unwanted access. Though the interior may be small and capable of fitting your pistol and a small reserve of ammo, the lockbox allows for quick entry and is designed with a pry-resistant door and solid steel construction. The sturdy construction will keep your firearm safe, but when it comes time to brandish it, the push-button, battery-less combination lock is easy and negates the need for a set of keys. Though you don’t need keys, a spare backup set is provided in the event you forget your combination. Making it even easier to open in the dark, the combination keys are backlit. When the correct combination is input, the door opens with a silent release of compressed gas and remains open until you’re ready to store your pistol again. No Batteries Needed: The combination lock does not require batteries, meaning you won’t be worrying about replacing them. Hidden Locking Mechanism: Thieves will not be able to crack this case as the locking mechanism, which can sometimes be popped with a paperclip, is hidden. Not Water / Fireproof: Though it will keep your firearm protected from unwanted use, it does not protect from water or fire damage. Key Sensitivity: Combination entry requires that each key be firmly pressed. It can be easy to not press hard enough, requiring the combination to be entered again. Fingerprinting is a rather secure method of keeping anything safe, so it’s no surprise that the security method has been implemented by trusted gun safe brands. BARSKA’s biometric safe is a completely protected means of storing not just your firearm, but also many of your valuable personal belongings and possibly even a second handgun and boxes of ammunition. One benefit of biometric scanning is that it can recognize multiple users, and BARSKA’s model can store 30 different fingerprints. Even if multiple users aren’t necessary, one user can store a variety of fingerprints to make access even easier in tense scenarios. Should the fingerprint scanner not work, the BARSKA comes with backup keys that are so unique in design that the lock is virtually impossible to pick. This safe is a lot more than just a gun safe and the spacious interior, measuring approximately 16” x 7” x 14”, is large enough to store a multitude of items. If you don’t have shelf or closet space to store the BARSKA Biometric Safe, it comes with all the hardware necessary to mount it in a convenient location. Multiple Fingerprint Storage: Up to 30 different fingerprints can be stored, meaning multiple users can have access and one user can store data for multiple fingers. Large Storage Space: Unlike many pistol gun safes, this biometric safe is spacious, with more-than-enough room for a pistol, ammo, vital documents, and valuable items. 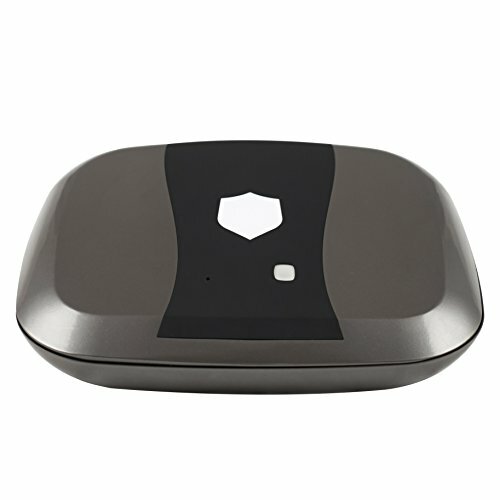 Overly Sensitive Fingerprint Pad: Constant cleaning of the fingerprint pad is required as the reader is very sensitive. Heavy and Larger: At 31 lbs, this safe isn’t as easy to move and store as other models. It’s bulkier size also makes it a little more difficult to conceal. If you’re unsure of where to start when it comes to buying your gun safe, this buyer’s guide will put you on the right path and lead you a sensible decision. As you get into the buying process, there are multiple questions you want to stop and ask yourself. Answering them will better direct you on your path to finding the long gun or pistol safe that is best for you. Why Should I Own a Gun Safe? This is a common question that comes up, mostly dealing with 2nd Amendment Rights and protecting the individual’s right to bear arms in their own home; but there are many reasons why you should consider owning a gun safe. Child Safety: Maybe more important than preserving the 2nd Amendment is keeping children from accessing a pistol or long gun without parental or guardian supervision. Even if state law doesn’t require a gun safe in place, even when a child is present, owning one can avoid tragedy should a curious youngster be living with you. It Will Keep You Safe: Without a gun safe, there are only so many places you can hide a pistol. Even fewer when it comes to rifles. Image a scenario where you’re sound asleep in your home when a silent intruder finds their way in, locates your firearm, and uses it against you. You could even know the intruder, which means they likely know you own a gun. While they may not use it against you, if they take it and use it to commit a crime, legal issues and guilt will be coming your way. It’s the Law: Before you buy a gun and refuse to own a gun safe, you’ll want to check with local laws to see if it’s required that you own one and keep your firearms locked within it when not in use. States like California have specific requirements when it comes to gun safes, so be sure to follow these specifications to be in line with state and city laws. Protect Your Investment: Guns aren’t cheap. Gun upkeep isn’t cheap. Gun accessories aren’t cheap. If you don’t see the pattern yet, it’s that gun owners tend to spend a lot of money on their firearms. Your insurance company, however, may not cover the total cost of your guns and accessories. Some AR-15’s cost $5000 and up. Some companies will only consider covering $3,000 or less when it comes to firearms. Gun safes negate this worry, especially those rated as fire and waterproof. You May Save Money: We all love to save a few bucks every month, and your insurance company may be willing to cut your insurance rates if you lock up your firearms. Check with your insurance company to see what discounts may be given when you add a gun safe to your home. Don’t forget that saved money can go towards more ammunition! Fire and Water Can Damage Firearms: We’re not always in control of what happens in our home, so should it ever go up in flames or fall victim to a flood, you want to make sure your firearms are protected. Some gun safes are rated to withstand temperatures of 1,800°F for up to one hour. They Protect More than Guns: It’s true. Many gun safes, especially long gun and many pistol safes, are large enough to store multiple firearms and ammunition along with some personal effects. A gun safe can not only protect your firearm but also whatever valuable items you may have lying around the house, unsecured. You’ll Always Know Where It Is: We all forget things and it’s not completely ridiculous to think that, maybe one day, you forgot where you hid your pistol. Seeing as how this is not ideal for a multitude of reasons, having a gun safe will negative that possibility. There’s No Reason NOT To: You may argue that gun safes hinder access to your weapon, but that’s not necessarily true. Most gun safes, especially pistol safes, are designed for quick access and can be stored in convenient locations. Some can even be mounted while providing the same level of protection. RFID, Bluetooth enabled, and biometric safes can even be opened without fussing with a combination lock or key. 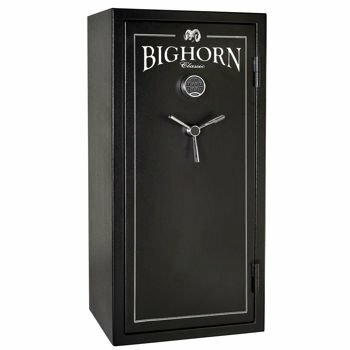 What Do I Want Out of My Gun Safe? Of course, firearm protection is the number one priority when it comes to your gun safe, but are there any other features or traits you may be looking for? Consider this list while you’re shopping as it may touch on a few things you haven’t considered. Size: Before deciding how big of a safe you want, look at the space you have to store one. If you can handle it, chances are you’re going to want a rather sizable safe. Something that can hold not just your firearms but also your valuable personal belongings and jewelry. You also want to think about the future. Will you be purchasing more rifles or pistols? If so, keep that in mind while you’re looking at the storage space of your gun safe. Steel Gauging: Your number one priority with your gun safe is ensuring that no outsider can get in without your permission. This includes thieves who may try to break into it while you’re not around. The higher the steel gauge, the more unlikely it is that they’ll be able to penetrate the exterior of the safe. Steel comes in a variety of gauges, but for your gun safe, try to stay at or above 8-gauge. At this level, the steel is nearly impenetrable, so they won’t be able to drill or pry their way in. Thick Door: How thick the access door is will determine just how resilient your safe is. A thicker door, especially one measured more than 5/16”, is going to prevent burglars from being able to pry, blast, or drill through it. Also, keep on the lookout for doors made from pieces of steel as the bends in the metal give it more strength while increasing fire protection. The Bolts: These important aspects of a gun safe are what keep the safe from opening. When the lock is engaged, they slide to lock the door in place, extending from the door itself to the body of the safe. Thick bolts are more durable, but you also want multiple bolts. Some safes only have two while others may be designed with up to 10 steel bolts. In this case, the more bolts, the merrier. Locking Mechanism: Unless you’re not worried about intruders, you probably want a gun safe that provides quick access to your firearms. For that, you’ll want to look at the different locking mechanisms. If rapid access is a concern, you’ll want to veer away from key locks and possibly even combination locks. Many gun safes are equipped with biometric (fingerprint) scanning, but you can also find locks activated through RFID signals or Bluetooth via smartphone applications. Mounting and Anchors: Protecting your firearm sometimes means more than just locking it in a safe. Think about how easy that safe is to transport. Can someone just pick it up and walk off with it? Though a thief may not have the means to crack it in your home, if they’re able to bring it back to their abode, they may be able to gain access. While a hefty gun safe will prevent this, so, too, will one that comes with mounts or anchors. If you find a safe with no means of mounting, contact the manufacturer to see if you can modify it without voiding the warranty. Alarms: Want to know when someone accesses your gun safe without your permission? Some safes are equipped with alarms that blare when the wrong combination is input multiple times. Other safes are designed to blare an alarm if moved or picked up. Failsafe Locking: With some combination locks, it’s not impossible for a burglar to guess your combination, but there are gun safes that lock up completely when the wrong access code is input multiple times. It may become a pain when you forget your code, but it’s an added level of security that won’t hurt to have. Battery-Powered: Anything with an electronic keypad will require batteries. Is this something you want to deal with? If so, try to find a gun safe that has a backup option for access, typically like a key. For pistol safes, you may even find some that sport a rechargeable battery for added convenience. Maximum Protection: This is what it all comes down to. You want a safe that provides maximum protection for you and yours. That means steel that can’t be drilled into, a lock that can’t be pried open, a combination that’s not easily cracked, and a safe that can’t just be stolen. When it comes to the items inside, you should consider a safe that’s fire and waterproof so that maximum protection can carry over to your firearms and valuables. Safes that are BF rated are near impossible to crack into if not given immediate access. There are obvious reasons why you want to own a long gun safe. If you’re an avid collector of rifles or even shotguns, you’ll need the necessary storage space; but just because you don’t own a long gun doesn’t mean a long gun safe is out of the question for you. Many pistol safes aren’t designed to hold much more than the handgun and a small stock of ammunition. While a rifle gun case may seem like overkill to compensate for this shortcoming, you have to think of everything else you may be wanting to keep in a locked safe. Gun safes are multipurpose, with their first intention being to keep your gun stowed away and out of reach from unwanted handlers. Beyond that, they can serve as regular safes that can protect valuables like jewelry, high-end electronics, and important life documents. If you only own one or two handguns but have a lot you want to store away in safekeeping, a long gun safe may be a better option. Are Combination Safes 100% Effective? When you consider all of the things that can happen with a safe combination, you may be wary of owning a combination safe. Don’t, however, completely write the idea off yet. Combination locks can be an effective means of securing your firearms, but much of that security has to come from you. When you set a combination, never write it on a piece of paper. First off, there’s a good chance you’ll lose it. Second, if anyone happens upon it and figures out what it’s for, your firearms are no longer safe. Especially children, who are curious about everything in the home. This also means, when you input a combination, make sure nobody is watching and looking over your shoulder. Number series aren’t difficult to remember, especially shorter codes. Trust your code with two people only – yourself and your spouse. Agree to never share it with anyone else. If you do fear you’ll forget the code over periods of not using it, store it somewhere that can be locked up, such as your phone. Don’t label it “Gun Safe,” however, on the off chance someone cracks your phone’s password. Do I Want Electronic or Mechanical Locks? Are you a technophobe that’s worried robots will be running the world one day? Well, in the realm of gun safes, you don’t want to completely cut out an electronic safe as an option. Nor do you want to ignore mechanical locks. Both have their pros and cons, it’s just a matter of you deciding which cons you want to deal with and which pros are more worth the money. We discussed previously how all electronic safes require batteries. At some point, those batteries will die, leaving you with two options: either having spares on hand to replace them or utilizing the less-convenient backup method of unlocking the safe. For safes that don’t have rechargeable lithium batteries (which typically only comes in pistol lockboxes), electronic keypads run off of AA or 9V batteries and have a set of backup keys for entry. The benefit of electronic locking mechanisms is that they are easy and quick to open. Fingerprint scanners and RFID readers open within seconds, providing quick access in emergency situations. When it comes to mechanical locks, you will have to deal with a key each time you want to open it, but there’s no concern over batteries going dead at inopportune moments. It is a matter of preference, though it can be argued that electronic safes offer the best of both worlds if they’re designed with a backup mechanical lock. Earlier, we discussed possible laws in place that require you to own a gun safe and store your firearm when it’s not in use. While there are 11 states that require some form of locking device be in place during the transfer or sale of a firearm, there are only four states that require guns to be stored when not in use. Of those four, only one state, Massachusetts, has a strict set of laws that require firearms to be locked up when not in use or in the owner’s possession/control regardless of the city. States like California, Connecticut, and New York require locked firearm storage, but only in certain cities. For instance, Californian cities like San Francisco and Sunnyvale and Albany, NY require all guns to be stored in a lock depository when not in use or possession/control of the owner. Though your state may be among the 46 states without laws in place, that doesn’t mean you shouldn’t own a gun safe. You may not be legally bound to store your gun, but it’s still a sound investment that will keep you, your family, and your firearms safe from the unexpected. Aim like you mean it. Budget scopes for quality & precision.